Mint-Ease has been widely used by our Physiotherapists, Osteopaths, health practitioners and sports injury clinics over the last 12 years. It provides a deep heat followed by a soothing cooling effect after 10 minutes. It is very effective and a great pain reliever – tried and tested on thousands of happy patients. Massage in well for best results! 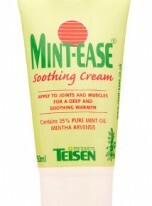 When rubbed into the skin Mint-Ease produces an initial cooling effect followed by a deep lasting and soothing heat. This effect is due to the increased blood circulation and analgesic action promoted by the mint oil on pain receptors, very similar to having a great massage. Mint-Ease is a natural product. It contains 35% pure ethereal Mint Oil extracted from the plant Mentha Arvensis and is produced to British and European Pharmacopoeial standards. The oil is refined to obtain a natural purity without the need for additives and has a high menthol content. The result is that you have the ability to promote warming blood flow. Its benefits, wherever it is needed speak for themselves. Mint-Ease currently used by our practitioners, sponsors and is being used by the Northern Ireland National Powerlifting team and a variety of Rugby clubs and athletes. Massage into stiff/ sore muscles and around joints. Wash hands after use as the cream is strong and may irritate eyes. Do not apply to more than 25% of body. If you have any questions about any of our products or cannot find what you are looking for, please do not hesitate to contact our Head Osteopath, Ian Norman.